Pickled quail eggs make a wonderful snack or party appetizer. The miniature eggs are bite sized and tasty, and by varying the spices you can offer an array of delicious flavors. Use this basic recipe to pickle your quail eggs, and then change the spices to alter flavors. The recipe yields 24 quail eggs. Put the quail eggs in a large saucepan and cover them with water that is at least one inch above the top of the eggs. Put the pan on the stovetop on medium-high heat and bring them to a boil. Remove the pan from the heat and cover it. Allow the eggs to sit, covered, for three minutes. In a large bowl, prepare an ice bath with ice and water. As soon as the three minutes are complete, use a slotted spoon to move the eggs into the ice water to stop them from cooking. Leave the eggs in the ice bath for five minutes and then remove them. Place them in a separate container and refrigerate until the brine is ready. In a medium saucepan, bring the vinegar, water, sugar, salt, and pickling spice to a simmer. Cook, stirring, until the sugar and salt dissolve. Remove the brine from the heat and allow it to steep and then cool to room temperature, about two hours. Carefully peel the eggs and put them into a large, wide mouthed jar. Strain the cooled liquid through a fine-mesh sieve and then pour it into the jar over the quail eggs. Put a lid on the jar to seal it tightly refrigerate for at least 24 hours, and as long as one week. Using this basic brine recipe, you can add different herbs and spices to change the flavor of the quail eggs. 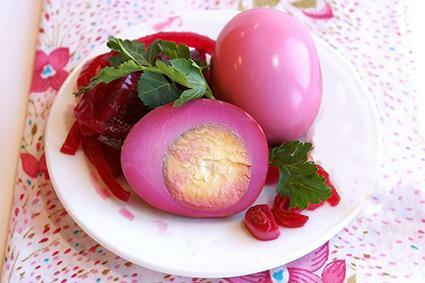 For pink quail eggs, add 1/2 cup of grated beet to the brine before you bring it to a boil. For hot pickled quail eggs, add 1/2 teaspoon of cayenne to the brine mixture before bringing it to a boil. Instead of using pickling spice, make your own, using two chopped garlic cloves, three whole allspice, and four peppercorns. Replace the white vinegar with an equal amount of apple cider vinegar, white wine vinegar, or tarragon vinegar for a different flavor profile. If you prefer your quail eggs low-carb, replace the sugar with an equal amount of an erythritol-based sweetener such as Swerve or a stevia-based sweetener such as Truvia. Spice up the basic recipe by adding 1/4 teaspoon of crushed red pepper flakes, four peppercorns, and a half teaspoon of mustard seed to the brine before you bring it to a simmer. The pickled quail eggs will keep refrigerated in a tightly sealed container covered with brine for up to three weeks. You can serve the quail eggs cut in half pole-to-pole and sprinkled with coarse salt for an attractive appetizer. They also make a tasty egg salad, are delicious on salads, and make a lovely garnish. No matter how you choose to serve these eggs, however, they provide a delicious and different take on the traditional hard-boiled egg.